I’m often asked where the ideas for the flavours, styles, and even the presentation of our menu here at En Izakaya. In this “Inspiration from Japan” series, I’m going to cover a few of the food trends and influences I picked up during my recent trip back home, and some thoughts as to how they may “translate” to our En Izakaya menu. In this first part, I thought you might like to hear how I enjoyed the Japanese “Kappo” style of cuisine, and how we have incorporated some of the elements into our En Izakaya menu. While traditionally, the word “kappo” just means to “cut and cook”, these days, Kappo means a more traditional and sophisticated Japanese cuisine. In Japan, Kappo restaurants are a higher-class, fine dining experience, still, with a focus on the superb quality of the seasonal ingredients and the chef’s expertise. In some Kappo restaurants, you can actually watch the chef while the are cooking. Kappo cuisine is all about savoring the pure beauty and flavor of food in a lively atmosphere, as well as the superb quality of the seasonal ingredients and the skill of the chef. Rather than a particular cooking style, with Kappo, it’s completely up to the chef! As you (probably?) know, traditionally, an izakaya in Japan, is a casual place for after-work drinking, catching up with friends and for its is smaller tasting plates, designed to be shared. An En Izakaya, I like to think that we have been influenced by every great dining experience we’ve had – including Kappo. We take the fun, sharing and catching up with friends and match it with an innovative and more modern approach to the taste, texture, aroma & appearance, for a more modern izakaya experience. It’s often said, that in Japan, Kappo restaurants are usually small and cozy, frequented by regulars and known only through word of mouth. A bit like En Izakaya really! We are able to present the suburb quality of our seasonal incredients, in unique shared dishes, that are designed to bring out the flavour of the primary ingredient. A perfect example, is our seasonal special of orange roughy, with red miso and yuzo – created to specifically bring out the sweetness of the fish. The other element of kappo cuisine is a precision of presentation and plating – something that is a key element of the experience here at En Iakaya. If yoyu notice the style of the Kappo plating, and look at the way we present our dishes at En Izakaya, you’ll see where some of our inspiration comes from. So, we look forward to seeing you again soon. 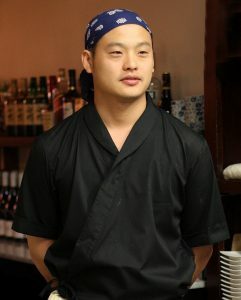 Kota Ogawa has held the title of Head Chef at En Izakaya for the last 4 years. 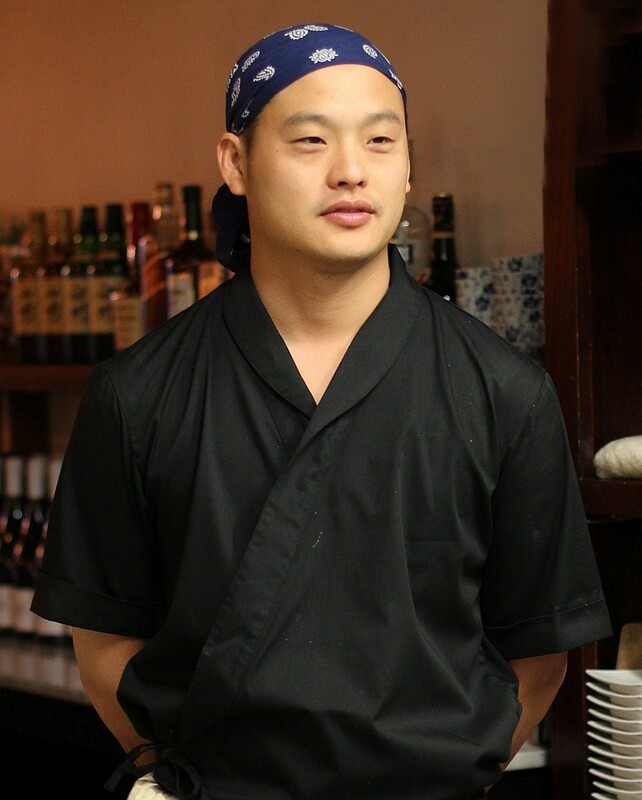 Born and raised in Takayama, Gifu prefecture, Ogawa-san had previously completed Japanese cuisine training under the supervision of a Japanese chef. Other notable employment positions included working in a ‘2 chef hat’ venue in Melbourne with a Michelin restaurant trained chef. He holds a Certificate 4 in commercial cookery. As one can appreciate, Ogawa has several philosophies and thoughts regarding Japanese cuisine and specifically the growth in popularity of izakaya. “I feel passionately that Japanese food should be kept simple and at the same time highlighting the ingredients. The usage of seasonal ingredients is vital in maintaining a balanced menu. “When I use ingredients that are in season, it means they are super fresh and full of natural flavours. Izakaya food is not your typical Japanese restaurant food. It is more a collection of small dishes that are designed to be shared amongst friends. So please, come and join us and let Kota Ogawa and his team, excite you with their exciting and innovative modern Japanese izakaya experience.